We're told the suspect felt disrespected, left to get a gun ... then returned to get revenge. 4:05 PM PT -- A longer version of the surveillance video shows the shooter -- the man in the dark shirt -- opening fire 3 separate times on Nipsey Hussle. He shoots Nipsey once ... starts walking away ... then comes back a second time and shoots again, and then a third time. After the third time, he kicks Nipsey and flees back toward the alley ... where we initially saw him enter the video. Multiple sources tell us before the shooter unloaded, he had a tense convo with Nipsey. We're told Nipsey asked him if he had snitched to cops in the past because that was the word on the street. Nipsey Hussle's murder happened in view of a nearby surveillance camera -- and the footage could give police a lead in their search for the trigger man. TMZ obtained this footage from a business adjacent to Nipsey's The Marathon Clothing store. On the left side of the screen ... you can see someone in a red shirt enter the frame from an alleyway, walking quickly toward the front of the store. The actual shooting is hard to make out, but you can see a victim collapse to the ground, and several people fleeing the area. It's unclear if the gunman is one of those people running from the scene -- but the footage makes it clear there were several witnesses to the shooting. Also worth nothing ... while everyone's fleeing, you do NOT see the person in the red shirt running out of the lot. We also don't know if the victim you see on the ground is definitely Nipsey, but you can see he's wearing a white shirt like the one he was photographed in moments before the shooting. TMZ broke the story ... the Crenshaw rapper was killed Sunday afternoon, and 2 other people were shot, but survived. 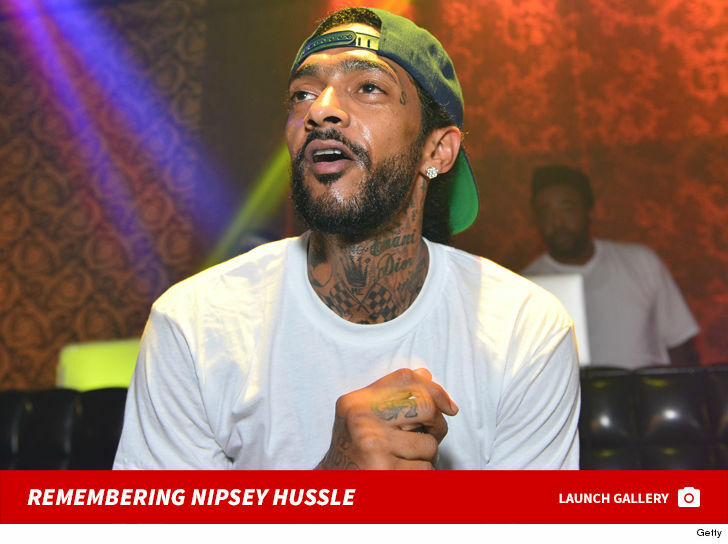 Nipsey was pronounced dead at the hospital after paramedics performed CPR on the scene and during the ambulance ride. As we told you ... Nipsey had, ironically, planned to meet with LAPD's police chief and commissioner on Monday afternoon to discuss a plan to prevent gang violence. Police have said his shooting appears to be gang-related.